Take a trip to our community gardens! April is here. As the snow melts and the flowers bloom, Adoption Network Cleveland is ready to grow our community garden. 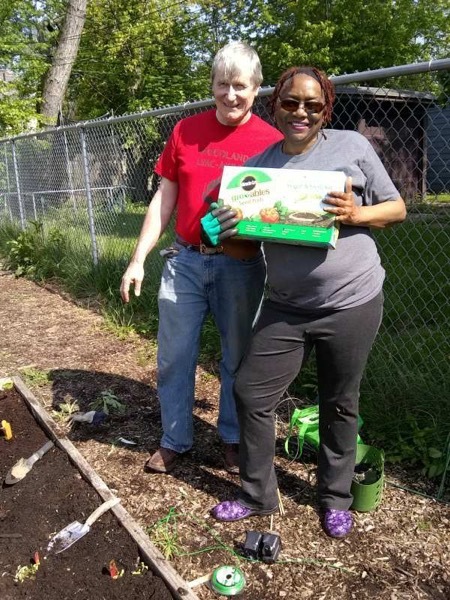 Last year, our Family Support Coordinators Ayanna Abi-Kyles and Robert ‘Gib’ Gibbons, created a vegetable garden in Shaker Heights, open to the families that we serve. They grew a huge bounty including tomatoes, collards, cabbage, cucumbers, kale, string beans, and a wide variety of herbs and flowers. The idea of a garden for our organization’s families sprouted in the mind of Ayanna early last year. She has a hobby of growing plants and keeps a garden in her backyard. Her interest in gardening began by creating her own organic source of food as a way to combat health problems. However, it became more than a food source for her. Gardening became her passion. The idea of nourishing life fit into Ayanna’s philosophy, that even the slightest positive change can make the world around you a better place. From there it was only natural for her to extend that passion to the families she works closely with. The idea behind the garden was to share not only a hobby but to educate the families as well. A community garden can teach you many things including planter tips and tricks to plant anatomy and biology to learn about healthy, organic eating. Part of the initiative is to promote local food sources by providing discounts to farmer’s markets around Cleveland and hosting a market day, where the harvest of the garden is shared among everyone who helped during the season. This year we have exciting, new developments - this spring a new garden will be located at the Nottingham United Baptist Church, offering a convenient location for those on the east side. Do you want to get your hands dirty and volunteer? You can donate seeds or plantlets, and learn about sustainable, local, organic foods. The gardens are always open! You can reach Ayanna at Ayanna.Abi-Kyles@adoptionnetwork.org.